So this was made in response to all of the testing I’ve been doing with wah pedals over the past six months. The circuit board was a blank perf board and uses the same header as any Vox wah so it can be swapped in and out without soldering. On board is a Fasel inductor, sockets for the transistors, trim pots, and a four DIP switches for 15 different filter frequencies. The blue trim pots control Gain, Midrange sweep, Volume, and two forms of Sharpness control. 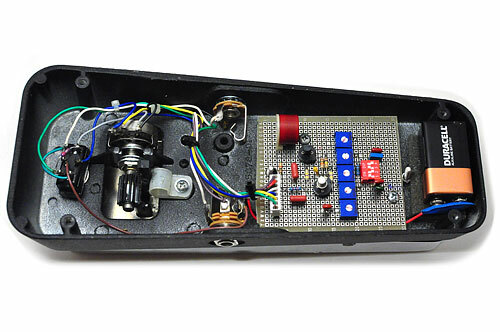 This gives almost any sound imaginable and allows the pedal to be dialed in for a variety of transistors. The controls are all visible when the battery door is removed to allow changes on the fly. Not sure if these will be sold due to the time involved, but the standard wah mods allow you to send in your own wahs and have the essential changes performed at a fraction of the price. This entry was posted in Custom Shop, Favorites. Bookmark the permalink.